PHUKET CITY: With the landfill at Saphan Hin continuing to pile up at the alarming rate of about 300 tonnes of waste per day, the provincial government hopes a new campaign promoting the use of cloth bags will help cut down the waste stream until a second incinerator is completed. The island’s sole incinerator, built and operated by Phuket City Municipality but responsible for all of the island’s waste, can process just 250 tonnes per day. Phuket now produces an average of 540 tonnes of waste daily, so the 290 tonnes that can’t be burned must be added to the landfill. The overburdened landfill now has four-meter-high berms surrounding it to contain all the extra garbage – and more is coming. 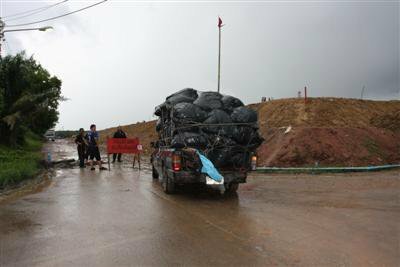 Phuket will produce 800 tonnes of garbage per day within five years, according to official estimates. The growing volume of garbage has already caused one ecological disaster. In June 2007, heavy rains caused a highly toxic plume of water from plastic-lined leaching ponds to enter surrounding mangroves and waterways, killing millions of farmed fish. Stench from the pile has also made residents of the nearby Ban Saphan Hin miserable, especially on days when onshore winds blow the stench straight into their community. Help is on the way, but a new 600 tonne per day incinerator planned nearby won’t open until October 2010, at the earliest. In the meantime, Phuket is facing a garbage crisis. But the province has a new weapon in the fight to reduce the amount of garbage it generates: the cloth bag. This week Phuket Governor Wichai Phraisa-ngop launched a campaign to encourage island residents to swap their plastic bags for re-usable cloth carriers. The project, run by Phuket Provincial Energy Office (PPEO), is being branded with the name ‘Phuket Green Island’. PPEO director Jirasak Thommayet said the ambitious project aims to reduce the volume of plastic bags used in Phuket by 60 percent, equivalent to 5,000 tonnes per year. “We need to take care of our island, starting by reducing the number of plastic bags we use and replacing them with cloth,” he said. Cloth bags will be promoted with posters showing the governor – one hand clutching a cloth bag, the other giving the ‘thumbs up’ – above the message: ‘Let’s use cloth bags together’. The project will include asking local businesses to offer discounts to customers who use cloth bags rather than plastic. “We’re also asking local government organizations to provide budgets to make cloth bags for Phuket villagers,” Mr Jirasak said.